To help you with your research we have added some information about Huntingdonshire. The map shows the area covered, the parishes (those with links have small snippets of information), the registration districts are listed and so are the hundreds. By clicking on a parish you can see what is available from our bookstall for that parish. These items can be ordered direct from our bookstall or on-line via GenFair. To aid in your research we have included a list of contiguous parishes here which cover Huntingdonshire, Cambridgeshire, Isle of Ely and the Soke of Peterborough. What is a continguous parish? Each parish within a county is bordered by other parishes, these are referred to as continguous or neigbouring parishes. From Anglo-Saxon times to the 19th century, a unit of local government common south of the river Tees. A subdivision of the shire, which had its own moot, it corresponded to the "wapentakes" of the Danelaw. Varying in size from area to area hundreds may have originated from the groupings of a hundred hides (a hide was a measurement used in the Domesday Book which was a land unit reckoned as 120 acres); they emerged as administrative units in the 10th century. Hundred courts, which met every four weeks had jurisdiction in cases relating to local issues and apportioned taxes. The hundreds were known as wapentakes in the North of England, while in Sussex there were rapes and in Kent lathes, which were groups of hundreds. By the end of the 12th century, they had ceased to be important, but were not formally abolished as units of local government until 1867. The term survives today in the Chiltern Hundreds. 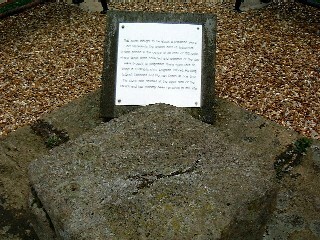 In the case of Leighton Bromswold this was a stone (see picture), now a 1,000 years old, hence the hundred of Leightonstone. The stone still exists but not in its original position, it now sits outside the church. How did the railways affect your ancestors in Huntingdonshire? HUNTINGDONSHIRE, an inland county bounded on the north and west by the county of Northampton, on the south-west and soutb by the county of Bedford, on the east by the county of Cambridge; it extends from 52o 7' to 52o 32, (N. Lat) and from 0o 2' (E. Lon.) to 0o 31' (W. Lon. ), in its broadest part; and it contains about two hundred and thirty-six thousand eight hundred acres, or about three hundred and seventy square miles, The population in 1821, amounted to 48,771. Before the Remons obtained possession of this part of Britain, the territory now included in the small county of Huntingdon formed the western extremity of the country of the Iceni; it subsequently became part of the great division of Roman Britain called Flavia Cæsariensis, and on the establishment of the Saxon octarchy, it was at first included in the kingdom of East-Anglia, but was afterwards annexed, by conquest, to the more powerful one of Mercia. The early annals of this county afford no materials for history but such as relate to the acquisition and possession of its earldom by the royal family of Scotland, which furnished the two crowns with an additional object of contention and mutual annoyance. A short time before the Norman Conquest the earldom, or governorship, of this shire (being then an office granted at pleasure and not an hereditary honour) was held by one Siward, who was in consequence styled Earl of Huntingdon, but who, having afterwards the earldom of Northumberland conferred upon him, was then calledd Earl of Northumberland. William the Conqueror, having taken into favour Waltheof, the son of Siward., gave him his own niece Judith in marriage. After the execution of Waltheof, on the charge of treason, his widow was offered in marriage to Simon de St Liz, a Norman soldier, but she refusing him, from dislike to his person, was deprived of her estates, which were conferred upon her eldest daughter, the latter being at the same time given in marriage to the Norman who her mother had rejected. Simon de St. Liz thus became Earl of Huntingdon; but dying in the begging of the reign of Heinry I., his widow was married to David, brother to Alexander, King of Scotland, and afterwards his successor on the throne, who, in her right. inherited the possessions of Waltheof, and was made Earl of Huntingdon and Northumberland. After his death, according to the fluctuations in the tide of political events, or in the favour of the English monarchs, this earldom was sometimes in the hands of the descendants of Matilda by Simon de St. Liz and sometimes in those of her posterity by her marriage with the Scottish prince. Henry, son of the latter, was at first admitted earl; but on his father's refusal to acknowledge Stephen, Count of Blois, as sovereign of England, to the exclusion of Empress Matilda, Stephen, seizing all his possessions in England, restored this earldom to the young Simon de St Liz. When the subsequent war between the two countries (in which both King David, and his son Prince Henry, invaded England, at the head of a large army,) was terminated by the mediation of the Empress, one of the conditions of the peace then concluded was, that the counties of Northumberland and Huntingdon should remain in the government of Prince Henry, as heir to them by maternal right and that for these lands, he and his successors, Princes of Scotland, should do homage to Stephen and his successors, Kings of England. Nevertheless, the possession of these counties was afterwards the subject of frequent disputes between the two crowns. On the ascension of Henry's grandson, Malcolm, to the Scottish throne, at the age of thirteen, he was summoned to London by Henry II., to do homage to him for the lands of Cumberland, Northumberland, and Huntingdon, on pain of losing them, and not long afterwards, Henry sent him a second summons, commanding him to repair to York where he had assembled a parliament, by which, on the charge of having in the late campaign in France, wither King Henry had carried him, betrayed to the French the plans of the English army, he was condemned to forfeit his English possessions. A war between the two countries ensued, but it terminated by a treaty concluded near Carlisle, in which it was stipulated, that Malcolm should receive back Cumberland and Huntingdon, but should make a full surrender of Northumberland to Henry and his successors for ever. On the breaking out of the war with Malcolm's sucessor, William, surnamed the Lion, in which the Scottish monarch was made prisoner, this earldom was seized. together with the rest of his possessions in England, which were afterwards held in pledge for that king's ransom, until delivered up by Richard I., on condition that all the castles and fortified places within the earldoms of Huntingdon and Cumberland should be garrisoned by his own officers and soldiers. In the subsequent wars occasioned by the rival claims to the Scottish crown, between the families of Bruce and Ballioll, this earldom was finally seized by the kings of England. since which it has been granted to several successive families. A portion of the lands however; was still retained by the Bruces, and from them descended to the family of Cotton. The ancient celebrity of this part of the country for the purposes of the chase has found a lasting evidence in the name of the shire and of the county town. According to Leland, the shire was in former times very woody, and the deer resorted to the Fens: it was not entirely disaforrested until the reign of Edward I. In later times, the only events of political importance that have happened within its limits, occurred in the course of the great civil war. The first of these was the plundering of the town or Huntingdon, in August 1645, by the king's troops, which, commanded by the king in person, and taking advantage of the absence of the parliamentary army in the west, had suddenly entered the associated eastern counties. 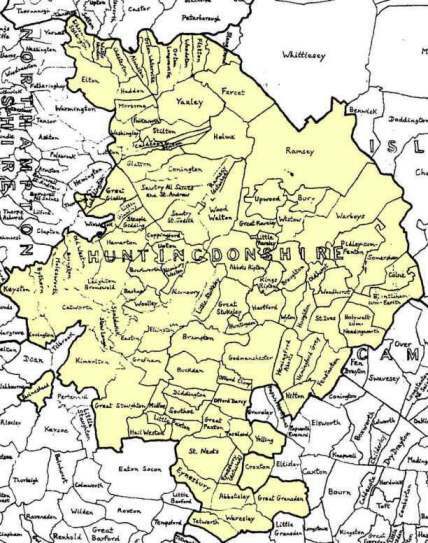 Again Huntingdonshire was the scene of a part of the hostilities occasioned, in 1648, by the appearance in arms of the Earl of Holland, the Duke of Buckingham, and others in the royal cause, with an immediate view to the relief of Colchester. The Earl of Holland, after being driven by some of the parliamentary troops from his quarters at Kingston upon Thames, and wandering over the country with about a hundred horse, came to St. Neots, in this county, where he was beset by his pursuers, and surrendered himself without resistance, two of his officers at the same time being killed upon the spot and the Duke of Buckingham making his escape by forcing his way through the enemy. Huntingdonshire is included in the diocese of Lincoln, and province of Canterburu and forms an archdeaconry, comprising the deaneries of Huntingdon, St. Ives, Leightonstone, St. Neots, and Yaxley, and containing ninety-three parishes, of which fifty-seven are rectories, twenty-nine vicarages, and the remainder perpetual curacies, or united with other parishes. For civil purposes it is divided into the four hundreds of Norman-Cross, which includes the northern part of the county; Toseland, the southern; Hurstingstone, the eastern; and Leightonstone, the western. It contains the borough and market town of Huntingdon, and the market towns of Kimbolton, Ramsey, St. Ives, and St. Neots. Two knights are returned for the shire, and two representatives for the borough of Huntingdon. This county is included in the Norfolk circuit: the assizes and the quarter sessions are held at Huntingdon, where stands the county gaol: there are twenty-two acting magistrates for the county. A peculiarity in the civil government of Huntingdonshire is, that it is included under the same shrievalty with Cambridgeshire; the sheriff being chosen, in rotation, one year from the county of Cambridge, another year from the Isle of Ely, and the third year from this county. The rates raised in the county for the year ending March 25th, 1827, amounted to £49,518.13; the expenditure to £48,276.12., of which £42,127.6. was applied to the relief of the poor. It has been observed that the temperature of the air varies nearly as much in this county as in any district in the kingdom of the same extent. The upland parts are very salubrious, while the fenny tract in the north-east is much less healthful, in consequence of the effluvia arising from the marshes, and the broad, shallow, and stagnant marshes: this district, however, has been rendered much more healthy by the recent improvements in the draining of it. The soils consist chiefly of clay and loam of various qualities, sand, gravel, and peat-earth; of these, the clay mostly predominates, being found all over the county; the sandy and light soils, and the loams, are dispersed in small tracts in different parts; and the peat-earth belongs almost wholly to the fens in the north-eastern part of the county. These fens, including the lakes, the chief of which are Whittlesea Mere and Ramsey Mere, comprise about forty-four thousand acres, and form about one-seventh of the great Bedford Level: eight or ten thousand acres of this may be considered as productive; but, as stated in the last agricultural survey of this county, drawn up for the Board of Agriculture, it requires a sum equal to two-thirds of their rental to preserve even these from inundation; for although they have a more elevated surface than those which lie between them and the sea, yet they are much worse drained, in consequence, as it is asserted in the report of the survey, of some defect in the original plan of the dykes. The county is rather bare of timber, which is owing to the very great demand for it in the fens. Turf is used as fuel in nearly half the parishes; but the inhabitants generally use wood and coal also, though in many places very little of the latter is burnt: in the cottages of the lower class, stubble, bean straw, reeds, and dried dung, are also used as fuel. The only rivers of magnitude are the Ouse and the Nene. The Ouse enters the county at St. Neots, whence it flows northward to Huntingdon: in the vicinity of that town it takes an easterly course by St. Ives, and having formed the boundary between this county and that of Cambridge, it enters Cambridgeshire near Earith, being navigable in the whole of its course through this county. The Nene forms the northern boundary of the county, separating it from Northamptonshire, and is navigable in all that part of its course. The greater part of the county, owing to the want of springs, is supplied with water from ponds. The great north road from London to Edinburgh enters the southern border of the county near St. Neots, and passing through Buckden, Stilton, and Yaxley, enters Northamptonshire at Wansford bridge. The turnpike roads are numerous, and most of them very good and well formed: in consequence of the scarcity of materials in many parts, a power is given to the commissioners to pick off all the stones that can be found on any of the farmers lands. The principal Roman stations in Huntingdonshire were Duroliponte and Durobriva, the sites of which are respectively at Godmanchester, or Huntingdon, and near Dornford Ferry. Of the ancient roads the three principal were as follows: - The British Ermin-street appears to have entered the county from the neighbour-hood of Cæsar's Camp, in Hertfordshire, and to have run by Crane hill, in the track since known by the name of Hell lane, whence, passing through Toseland, Godmanchester, and Huntingdon, and by Alconbury, Weston, and Upton, and falling into the line now called the Bullock road, it entered Northamptonshire at Wansford. The Roman Ermin-street entered the county from Cambridgeshire, in the vicinity of Papworth-St. Agnes, and proceeding, nearly in the line of the present high road, to Godmanchester, thence followed the course of the British Ermin-street, to the vicinity of Alconbury, where branching off to the eastward, it resumed the line of the present high road, through Sawtry, Stilton, and Chesterton, to the station of Durobrivæ, where it entered Northamptonshire. The Via Devana entered the county from Cambridgeshire, in the neighbourhood of Fen-Stanton, and proceeded, in the line of the present turnpike-road, to Godmanchester, whence pursuing the track of the British Ermin-street to Alconbury, it passed to the north of Buckworth and Old Weston, and entered Northamptonshire in the vicinity of Clapton. Numerous Roman coins have been discovered at Godmanchester: coins, coffins, urns, lachrymatories, &c., have been found near the site of the station Durobrivæ; urns and coins near Somersham; urns in Sawtrey field and Roman pottery at Holywell. The celebrated Cars-dyke, supposed to have been originally a work of the Romans enters Huntingdonshire at Earith, crosses Huntingdon river, passes by Littleport, and proceeds northward to the stream called the West Water, by Benwick, and then by that called the Old River Nene, to Whittlesea dyke. At the time of the Reformation, the number of religious houses in this county, according to Bishop Tanner, was nine, including one hospital: the principal monastic remain is the ruinous gateway of the ancient and mitred abbey of Ramsey, and the most remarkable churches are those of Bluntisham, St. Ives, St. Neots, Godmanchester, and All Saints, Huntingdon. Among the ancient mansion-houses, the most interesting, from their antiquity and other circumstances, are Buckden palace, the residence of the Bishops of Lincoln; Kimbolton castle, the seat of the Dukes of Manchester; and Hinchinbrook house, anciently the seat of the Cromwell family, and subsequently that of the Montagues, Earls of Sandwich, and Viscounts Hinchinbroke. There is a mineral spring at Somersham, but it is now in but little repute.